If your life has been seriously altered by a crash on a roadway, my father, Bruce L. Scheiner, and I want to help. The sad truth is that insurance companies may try to pay you as little as possible for your injuries. 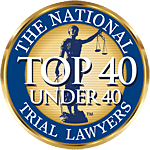 You'll need an attorney who has the experience to understand the uniqueness of your case and is committed to investing in the accident reconstruction and expert witnesses necessary to pursue maximum compensation. Justice is worth fighting for and we are committed to winning for you and there's no cost or fee unless we do.